Trauma finds us, through accident or cruelty or our own mistakes, and if we’re lucky we recover. What happens next? 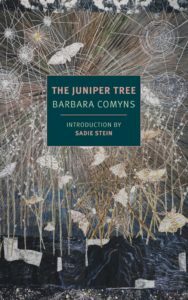 In Barbara Comyns’s The Juniper Tree, the answer is always “more trauma.” The novel, first published in 1985 and now reissued by NYRB Classics, is patterned on the Grimms’ fairy tale of the same name, which Comyns deems “too macabre for adults” on the title page. True, she leaves out the source tale’s cannibalism, but the darkness and motiveless action of the Grimms is never far. Where the novel differs from a fairy tale is that its action does not happen to an archetype, but a working-class single mother called Bella Winter, who carries a difficult past into the story she narrates. Bella’s narrative starts where another might have ended. When The Juniper Tree opens, she has survived a car crash and left the loser boyfriend who was driving. She has cut ties with her vain and immature mother. Even the ugly scar the accident left across her face has begun to heal — “the eye hardly notices,” she says with a touch of pride. Perhaps best of all, she has found a job where she flourishes, working for an antique dealer. She has become responsible, cherishes her independence, and dotes on her daughter (the result of a one-night stand). Happily ever after. In the first paragraph of the novel, Bella sees a beautiful woman standing in the snow outside a beautiful house. She cuts herself while peeling an apple, blood stains the snow. When Bella actually meets the woman, Gertrude Forbes, a few pages later, the cut has healed. The women become friendly, and soon Gertrude invites Bella into the tastefully appointed life she shares with her husband, Bernard. The Forbes are a strange couple. Gertrude is graceful and worldly, but seems in some way to be performing her elegance for Bella’s admiration. Bernard treats Bella with a patronizing fondness, “educating” her in classical music and the theater. When Gertrude becomes pregnant, the couple depends on Bella — to her delight — for emotional and domestic needs. It does not seem odd to Bella that these wealthy globetrotters spend every weekend with an antique store clerk and her toddler, nor does she hesitate to grant them authority over her life. “Maybe I needed organizing,” she thinks. There is real warmth in the Forbes’ relationship with Bella and her daughter, but from Gertrude’s blood on the first page, Comyns associates them with unsettling images: an empty child’s swing, an unnaturally lush garden, a pair of shifty-eyed magpies. Perhaps primed by her title page note, we feel these scenes as an intrusion of the macabre world of the Grimms into a more or less realistic 1980s London. Comyns layers these moments so finely that we shiver at things her first-person narrator is oblivious to, at least at first. As Bella becomes more enmeshed in the Forbes’ world, notes of horror creep into the story and proliferate until finally even she must take notice. Several of Comyns’s novels flirt with horror, and it is always expressed sharply and suddenly, usually in deadpan — in Our Spoons Came From Woolworths, she dispenses with a double suicide in one offhand sentence, then continues the story unfazed. She dabbles in magical realism, but her most chilling set pieces are always drawn from ordinary life: a charity clinic, a flooded farm, a dressing gown hung on a door. One of the scariest moments of The Juniper Tree is nothing more than the sight of some flowers on the floor. Comyns’s method is to mete out horror in these brief images (almost always images, rarely does anything scary happen) until it flares up in one brief and terrible instant. At lunchtime young men lay on the grass without shirts as if it were a beach and mothers with young children in striped pushchairs say under the trees while the elderly stiffly arranged themselves on the benches. All day the dedicated dog-lovers circled round, attached to their dogs by leads. Sometimes they were set free and a ball was thrown for their entertainment. At one end of the Green there was a much-used cricket pavilion and at the other a less-used public convenience — a good one people said — catering for men, women, and invalids. The faint moralizing, the painter’s eye for image, the appeal to conventional wisdom are all key to the Comyns style, and you could read through a library without finding such a perfectly weird description of dog-walking. The illusion is that we are very, very close to the speaker, getting the unfiltered jumps and flickers of her memory before narrative would ordinarily come along to smooth everything over. As Stein says, it is not easy to tell when Comyns’s artlessness is a technique and when it is more a symptom of her unstudied approach to writing, but this is one of the pleasures of reading her. Comyns was raised in a bizarre and chaotic household (dramatized in Sisters By a River, her first novel) and received a spotty education. In her books, scenes cut out abruptly, finely drawn characters are abandoned once they’ve served their purpose. The trivial aside and the critical plot point are told with the same cadence and affect, so that nothing is emphasized, and thus every development is unanticipated. This can yield marvellous deadpan humor: “We got on so well we even made jokes,” Bella says of her mother. In The Juniper Tree this approach spreads a queasiness through the narrative. We are never quite sure what we are reading, and it’s unclear how much Bella is telling us, or whether it’s true. Her narration feels guileless, but she sometimes omits important details from a scene, only to idly drop them several chapters later. A fairy tale, then, is an ideal subject for Comyns’s methods. Her bluntness is a natural fit for the old story, as is her use of the supernatural when it suits her needs. What she brings to the genre is an instability that pushes it into true horror. In some ways the horror is instability, that we cannot count on anything except our willingness to abase ourselves for love. Your self-sustaining life will leave you lonely, your lovers will take you from your work, the people you pay to create your domestic harmony will leave one after another. And should you avoid these pettier misfortunes, there is tragedy lurking out there: the medical complication, the unforeseeable accident — and always, our minds are ready to sabotage whatever peace is left. It never ends, not until the final disruption of death. We expect a fairy tale to descend into darkness, but what is striking is Comyns’s insistence on the difficulties in Bella’s life before the book begins. Happiness is not the baseline for Bella, she has worked hard to wrestle it down — which makes it all the more upsetting to see her lose it. Bella survives and survives again, perhaps because of her naivete — no one in the book doubts her account of the final catastrophe, except perhaps the reader — but we are far from assured that she is safe at last, that her desires will not lead her into trouble again. Horrific events in The Juniper Tree are unpredictable, but they are always a possibility. None of us are safe. Mark Clemens is a validation engineer writing from Illinois.